Just hours after Evan Blass provided the world with an image of the Samsung Galaxy S10, the reliable tipster is back with a hands-on video of a foldable tablet allegedly made by Xiaomi. 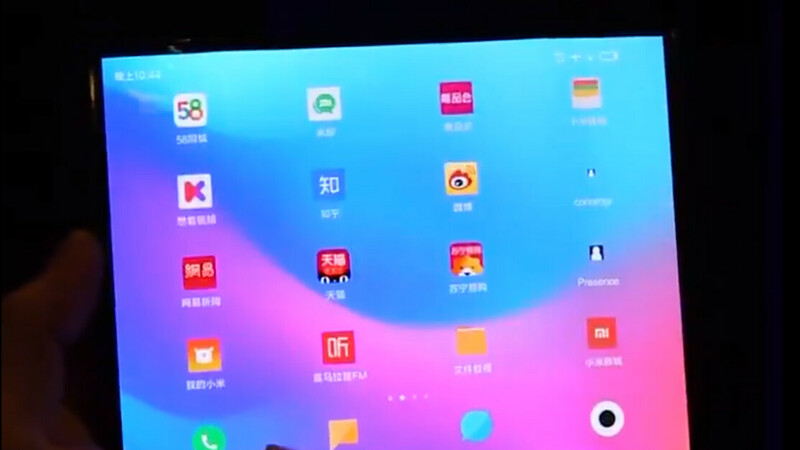 Running a version of Xiaomi’s MIUI 10 custom overlay, the first half of the 20-second clip shows the unknown user handling the device just like a traditional tablet. After initially unlocking the device, the person proceeds to open the Google Maps app. This functions just as expected but quickly adapts to the new form factor when the user begins folding the device. In this particular case, the display can be folded from both the left and right sides. This means that, when both portions are no longer in use, what is left resembles a wide, smartphone-like device complete with curved edges on either side. Evan Blass himself warned that he has no way of verifying the authenticity of the device or the video shown. However, speaking to PhoneArena exclusively, Ishan Agarwal revealed that he had previously received an email about this particular device. For those unaware, Agarwal is responsible for leaking a number of previous devices such as the recently-announced OnePlus 6T McLaren Edition. As customary, it’s still worth taking this leak with a pinch of salt. But that fact that two reputable leakers have both obtained information about the device suggests that there could be some legitimacy to the leak. Looks better than Samsung's foldable phone! Not even close, look at the bezels, just like something Chinese people would make, moving around, bending , plastic. Samsung one was rugged and solid material .. If you look closely, the bezels are fairly minimal. Look at where his hand rests against the body of the device. My guess is they're around the size of a S9 chin. Samsung's flodable phone have huge bezzels when it is not unfold. Haven't you seen the pictures? I've seen a display event where the device was in a case to hide the design. Please share some pictures of the actual device since you've seen them. Only downside is the thickness that a trifold design would give. Whatever it turns out to be Xiaomi are the type of company to achieve this. It's impressive if it's genuine. I'd certainly pay $1,000+ for something like that. But some will wait for Apple to "invent" it of course. Or Samsung to "invent" it. Though i'm sure Samsung or other big brand foldable will always the one that really sells. I like how it folds on this one rather than Samsung's, but unfortunately the software will be a let down just like the Vivo NEX. Chinese need to improve on their software, great hardware innovations but crappy software, especially MIUI, it's an adware. I like both Funtouch and MIUI once the launchers are changed. Different strokes for different folks. I also currently own a Mix2 and NexS. I just don't like how they treat their users. Xiaomi for instance, there are ads in system apps, that is unacceptable in anyway. Then you don't know much about miui. There's a setting to turn them off if you get one that comes like that and it's normally only the Chinese rom. None of my Xiaomi phones have had ads. My son has my Xiaomi right now but if I recall correctly you have to go into Xiaomi services in settings and disable "send analytics" or something similar. Anyway it has something to do with your Xiaomi account settings. I initially set up a Xiaomi account but didn't sign in on the phones and never got ads. I also disabled internet access for most of the unnecessary Xiaomi apps. For the value Xiaomi gives you with their phones it's no big deal. hmmm... I'm curious if they were the company that stole Samsung's tech. OMG, this is epic. If they can even hit the 1000$ price tag with this one, I swear they'll probably outsell Samsung's foldable phone! They won't sell it for $1000, their CEO said that there's no reason to sell a smartphone at that pricetag. Even their most expensive smartphone is still below $500 (Mi Mix 3), My guess is around $700-$800. I do understand but the tech is too expensive. If they keep it to 700-800$, they would hit the homerun easily! Well if i'm a smartphone manufacturer, the only one i will fear will be Xiaomi ..
Samsung phones also have light leaks though. It's on a completely dark room with quite high brightness, won't be noticeable on normal lighting even a dim one. Well, unless you are trying hard to see it. Liking Xiaomi's implementation of the foldable phone screen.